The heart of Soho tastes of curry. And masala. And coriander, yoghurt, and lots of secret spices. The Delhi Brasserie lies right off Soho Square and has been attracting a loyal clientele for absolute yonks. The décor is traditional and elegant with warm colours, comfy chairs and white table linens. The menu includes dishes like a starter of chicken kebab, many tandooris, lamb jhal frezi, madras or vindaloo, biryanis, and on and on. Superbly placed for pre- and post-theatre dinners, as it’s open seven days until midnight. Really tasty curry - quite a quiet atmosphere. Appreciated the kind staff showing me the allergen menu for my main meal however when my order for a black liquor coffee came back with cream on top (which I’m intolerant to) they refused to provide me with one without cream which was disappointing. I have always loved this restaurant ever since I found it over 10 years ago. It is easy to find in the heart of London and not far from our hotel and the area feels safe to walk through even at night as there are many pubs and people around. There is a dinning area on street level for those who cannot get around easily and it also has a smaller back room and a downstairs area too for larger parties. The food is excellent for the money and not over priced for the centre of London. The staff have always been kind and helpful over the years and we always come to this restaurant when staying overnight in London. Service was friendly and attentive; chicken korma and saag were highlights, also peshwari naan. Restaurant is very pleasant, white tablecloths. We went post-theatre as the Delhi Brasserie is open later in the evenings. We will return - a well-located, reasonably priced, with good Indian restaurant in Soho. Food was OK. Very small portions compared to other restaurants. Service was ok bc they initially wanted to stick us in the corner facing the wall. All three of us was going to face the wall in the corner, in the basement, while we ate. To me, that is not OK for mediocre Indian food. We've been dining at The Delhi Brasserie for 20 years or so -- when we're in London. Frankly, the restaurant has had its ups and downs over the years, but keeps reinvented itself and now, it is in a great period. Our meal and service was wonderful in every respect. I've gone back one more time within the week and had an equally favorable experience. Lovely food at Delhi Brasserie Soho. 2nd visit as food so very good. Staff very good too. Friendly service. Good fro special occasions and family and friends visits. Very disappointed with this place. They did not know we had a booking. We were seated downstairs. We were rushed with our starters as they said our mains were ready. Main portions very small for the price paid. We were rushed throughout the whole meal although restaurant not busy. Waiter stood over us while we were getting our cash for bill together. Not a good experience left there feeling hassled throughout. The food was good but not great. It's a very small restaurant with tables crammed together so not the most comfortable. If you are a party of 2 you will most likely be sitting very close to the main door or stair which isn't ideal. Service is fair and ambience is ok. I would not plan to go there again but if you're in Soho and want Indian food I guess popping by is an option. Superb. As usual. Thoroughly recommend. The Delhi Brasserie is a great value Indian restaurant in the heart of Soho. The menu is pretty typical Indian fare, with one or two special dishes (tandoori quail), but nicely presented and certainly up to standard. Service and atmosphere were fine. 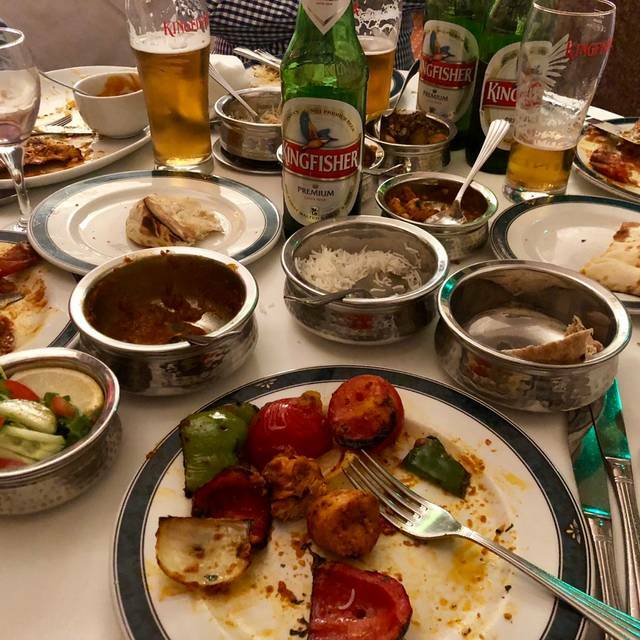 If you're looking for a unique or high-end Indian meal for a special occasion, this may not be the right place, but if you're looking for standard Indian meal in this very central area, with very good prices, the Delhi Brasserie fits the bill perfectly and is excellent value. The guys here go the extra bit and the food is amazing! Highly recommend going here! Delicious food and beautiful atmosphere. Very much recommended! Good honest Indian food. Great! This is the second visit to the restaurant, and the food was as good. The restaurant is always busy. Very good food, delivered fast by polite and caring staff. One gotcha though: we weren't too hungry and every guest is expected to order a main course, so be warned! Perfectly acceptable pre-theatre meal in heart of Soho. Dude who greeted us was rude- which was weird because we arrived sufficiently early so as to side-step the rush. I started to order, then said "could you stop me if I order too much or not enough, because I don't gauge these things properly", at which point he said pointed out that "we have a minimum £12 order per person"...umm, ok, great. Our chairs weren't pushed in far enough for him (odd thing to say - we're skinny people, and the restaurant was empty), our drinks sat empty, etc. Another dude joined the first, and he was more typically friendly. Anyway, we wouldn't go back. The food is good, but our guy was about as friendly as a traffic officer. The food was delicious and the service was outstanding. The food was okay, nothing special. Service was good and friendly. No concept about table reservation. People had to wait next to the door for 2 to 5 minutes to get a table. If more than one group comes in place for waiting gets really little. Food not spicy at all. The restaurant is quite small and the tables packed in which made it quite uncomfortable. The staff didn't have our reservation and asked repeatedly, including as they were serving the food, if we had definitely booked. The food was great but the staff weren't. Won't go back. A lovely little Indian in the heart of Soho. A small place with pretty décor, very good food (taste and value), and attentive staff. Average food, marred by poor service as they did not accept our Gourmet Society card for a party of ten. Muku, the manager, was very rude and was at risk of turning away over £300 of business. Very unhelpful so we would not recommend dining here based on the poor service received. Friendly staff, slightly under-spiced curry but nice ambience in a touristy area. This little gem is quite a find with authentic dishes which are mouth-wateringly tasty. The service on the other hand is hit and miss. Although I had booked we were seated wherever was free. Other diners who had booked had to wait outside until a table was free. Customer service was strictly pack them in then get them out! Very ordinary, non-authentic Indian food. People who like curry made for the Englishman's taste will probably find it fine, however. Was looking for a decent Indian restaurant near Covent Garden. The Delhi Brasserie was pretty much as you'd expect. Price was fair, food was good and the service was good. I would go back here again. Tasty food, authentic, good choice. Good service. Reasonably priced. We had a good meal here. The food was lovely although the portions were fairly small. The waiters were overly attentive at times. The restaurant was quite small which was a shame because the decor was great. Great food and very good service at a good price. Had a lovely meal with my wife and enjoyed ourselves thoroughly. Booked a table on a Saturday night and glad we did as around 7pm the place was very busy. Walk ins had to wait up to 20 mins for seat. Eaten here many times, not the cheapest or the best but the service is always the best. The place is a bit overpriced, but the seatings and ambience is more child friendly then your usual Indian place.